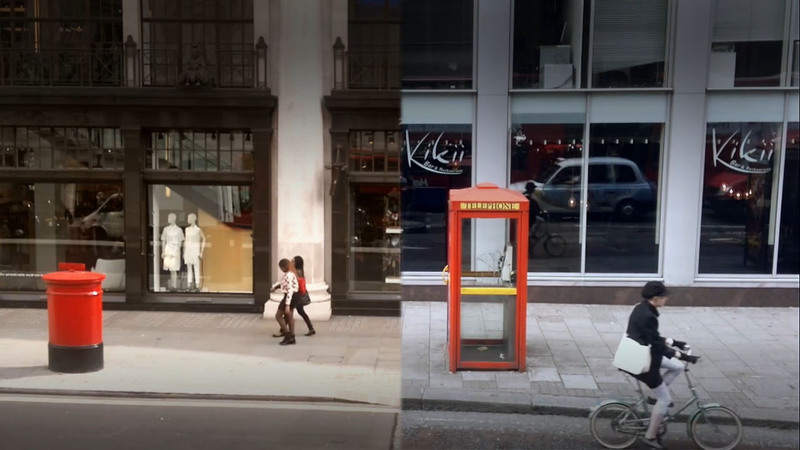 As part of the promotional events for a new mobile phone, Nokia held a short film competition in 2011 and gave 8 shortlisted entries a budget of $5000 to create a film shot entirely on their mobile phones. 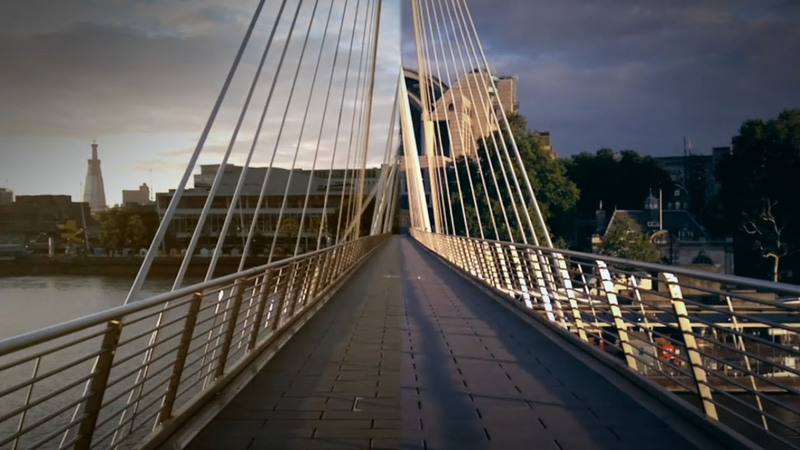 The winning entry by James Griffiths, Splitscreen, tells the simple story of a young man and woman from two different cities and their chance meeting on the Thames in London. Told from a first person perspective, the charmingly delightful film is an example of the way in which cities take on the sense of character and the abilities of urban forms to conjure a set of personality. The main characters of the film, the man and the woman, appear for only 5 seconds towards the very end of the 2:00 film. The other 1:55 are used to depict the travels of the characters from their respective cities to London. 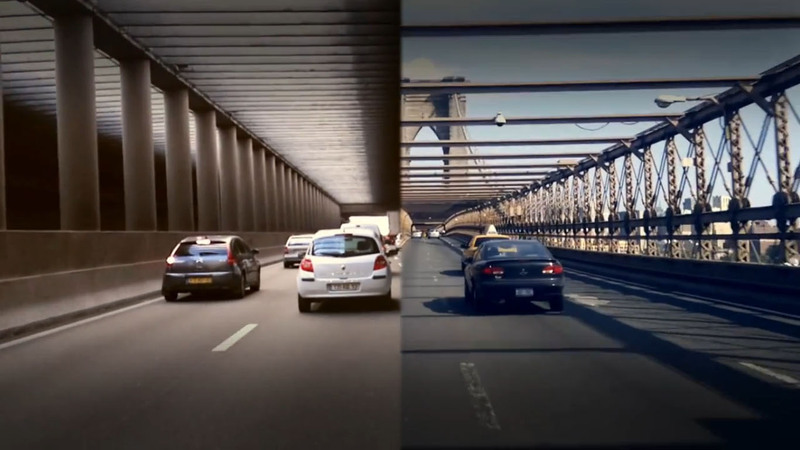 This is portrayed through a division of the screen into two halves (hence the name, Splitscreen), and shows the perspective of the city from the two characters. 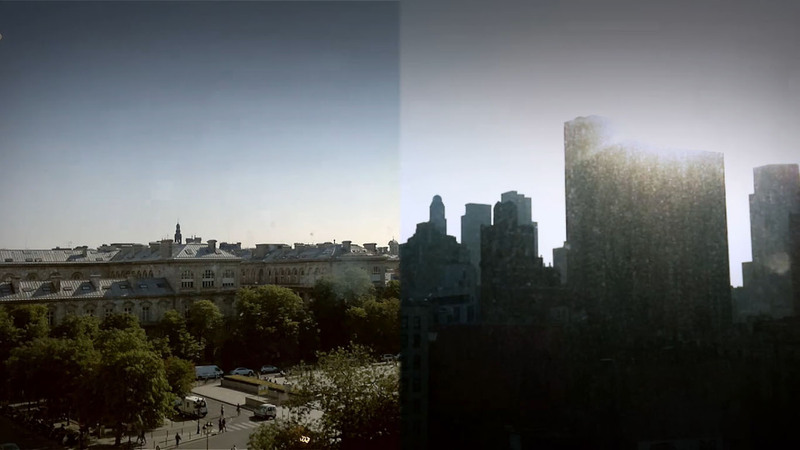 On the left is the view of Paris through the eyes of the woman, while on the right, the city of New York as seen by the man is shown simultaneously. 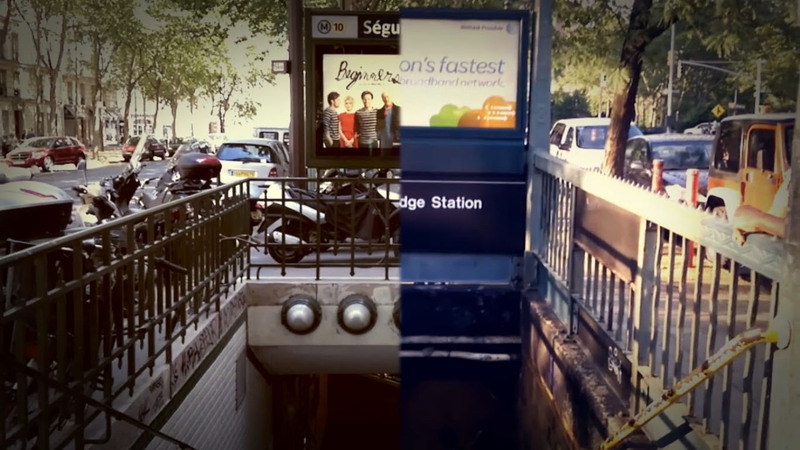 Through cleverly timed cinematography, the two screen interact with each other to create one complete image, despite the differences between the two cities. Starting off slow with shots from inside the apartments, the concept is clearly shown through the breakfast scene. 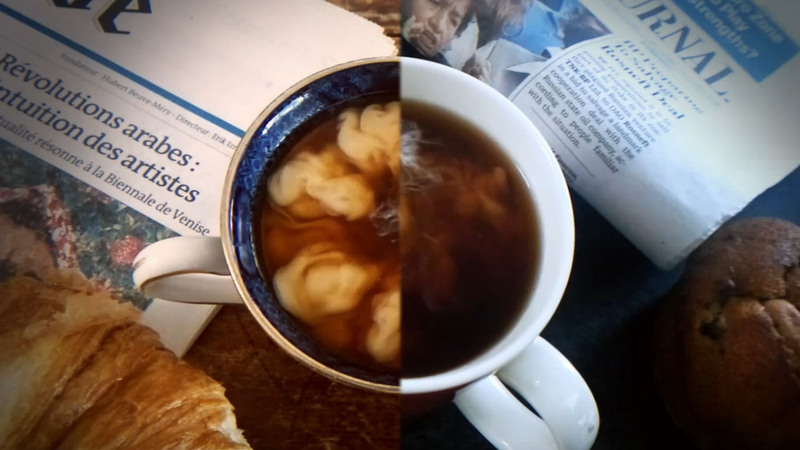 A croissant and a copy of Le Monde creates an instantly recognizable image of France while mirroring the setting in New York, the breakfast becomes a muffin and the Wall Street Journal. 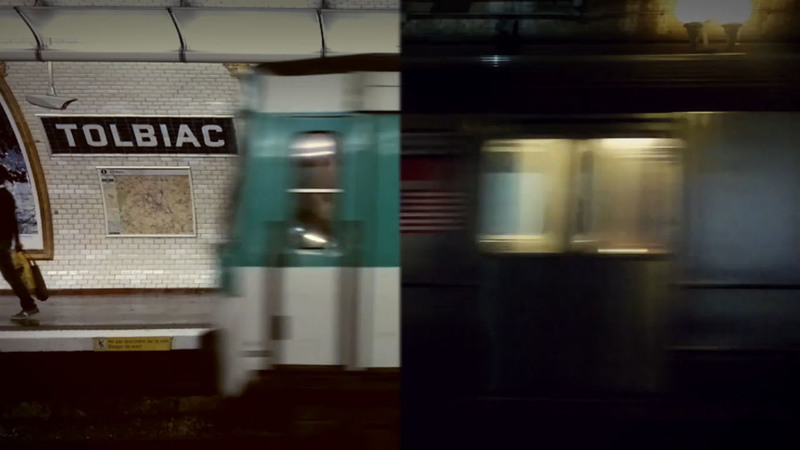 Leaving the apartment, the protagonists walks into the street and into the subway (the use of a non-Guimard entrance to represent Paris seems to be a missed opportunity), where the tiles and advertisements further emphasize the city in which the film takes place. 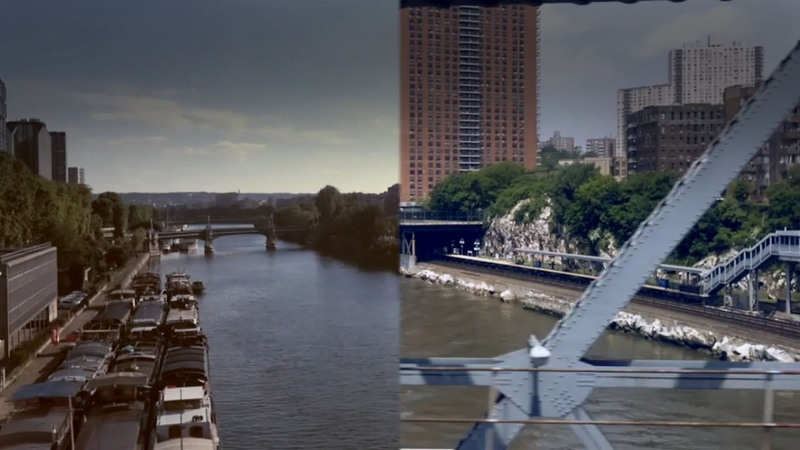 If these were not a giveaway enough of which half of the screen Paris and New York are in, an aluminium New York subway then enters from the right of the screen but emerges from the midway point as a turquoise Métro before heading off-screen. 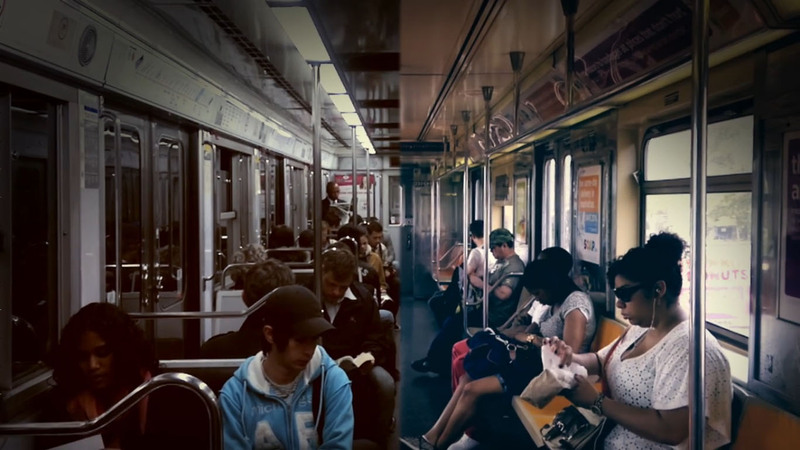 Shots of the film which shows the inside of the subway show the little details which define a city and how people react to their surroundings. Whereas the New York subway has bench seating facing a wide corridor, the Paris Métro has more conventional seats which look in the direction of the train’s travel. 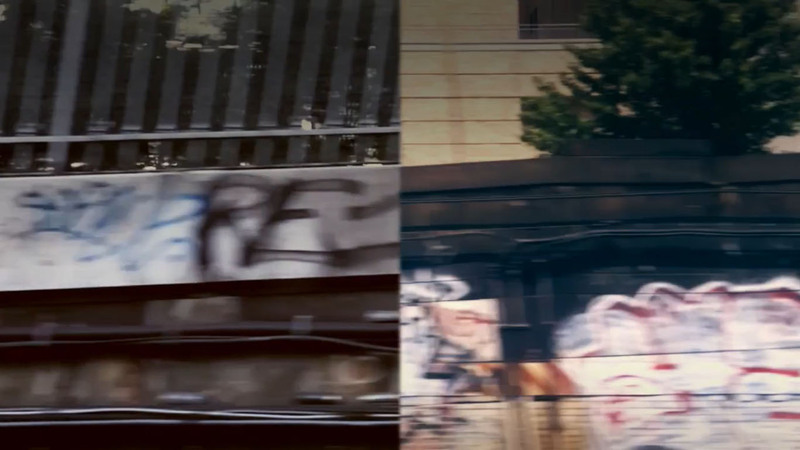 The shot then shows the train emerging from underground through a graffiti infested tunnel and across the “East “River” Seine”. 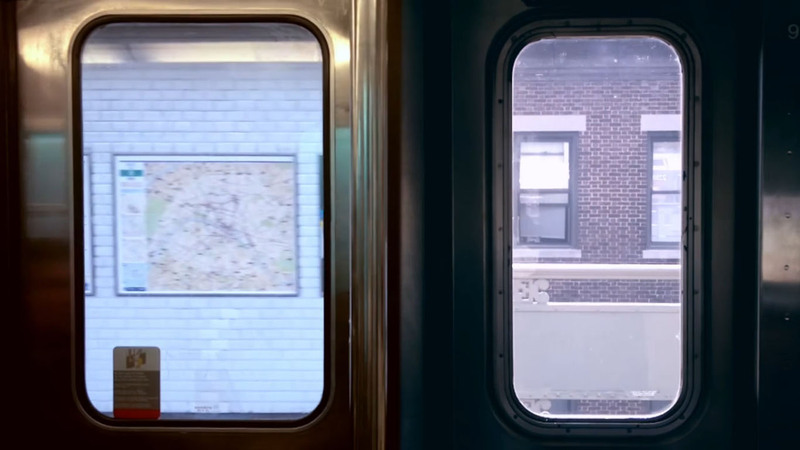 Again, the small details of the station as the train enters the platform such as the map of the Métro and the bricks of the surrounding buildings built up against the New York subway offers glimpses into the setting of the film. Taking a taxi down the boulevards of the two cities also brings about a strange sense of novel perception. While on the left of the screen, the Arc de Triomphe looms in the horizon beyond the tree-lined boulevard, the right is populated with yellow taxis and hot dog stands with their iconic yellow umbrellas. 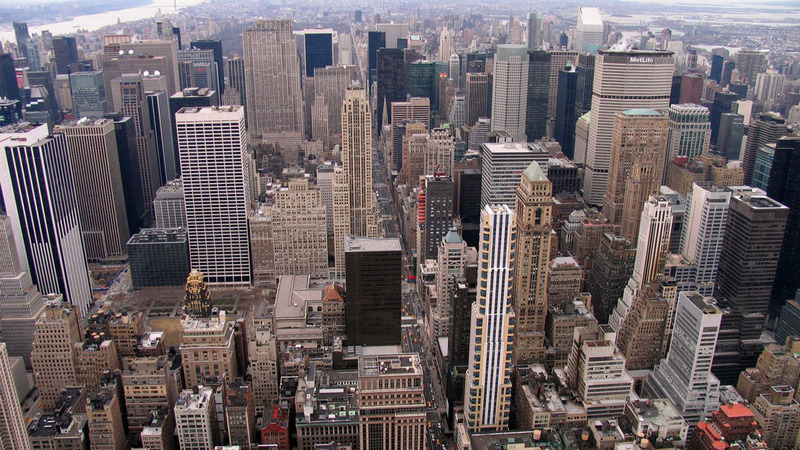 Details of the city such as the vigorous building height limitation of Haussmann’s streets and even the traffic or street lights of Paris contrast heavily with the skyscrapers of New York and its Americana streetscape. About midway though the film, the characters hop onto a plane and fly off to London. The images of the sky, although different, begins to convey a sense of convergence. 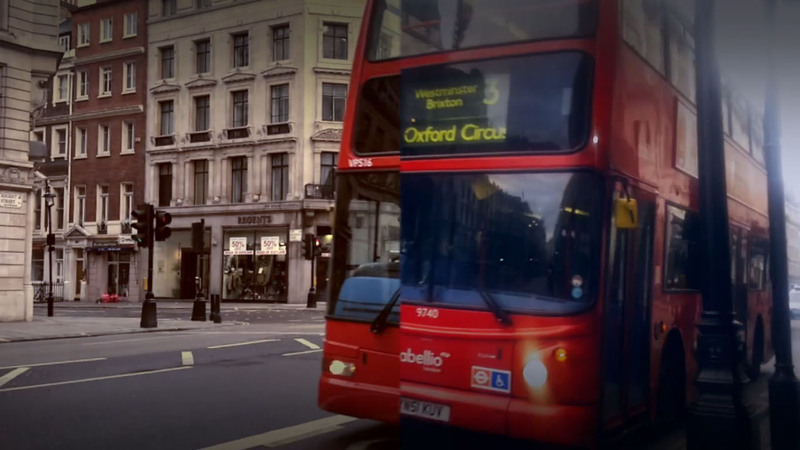 This is confirmed through images of the iconic London double decker bus as it travels across the screen in a scene slightly similar to the one of the city subway. 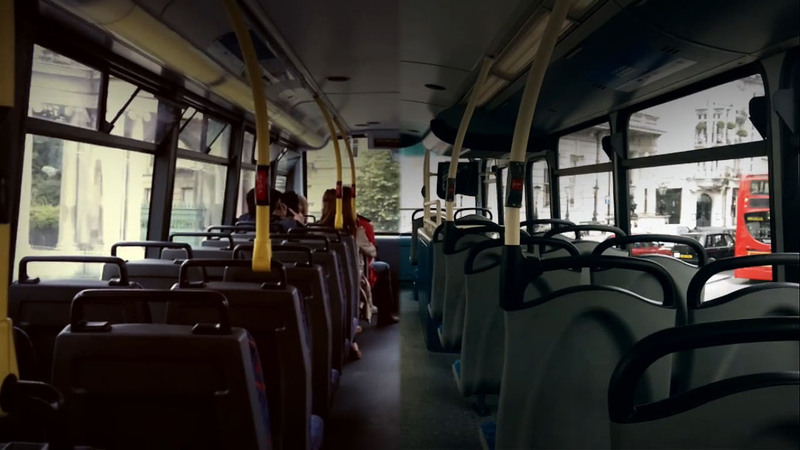 Looking at the bus in detail, it is clear that the one which emerges on the right and goes off screen on the left, while both painted red, are in fact different makes of the London bus (though neither of which are the iconic Routemaster) and suggest the characters are going through similar places and witnessing the similar things though with slight changes in detail. The shots of the bus’s interior is a good demonstration of this. While the subway trains of New York and Paris has very different seating arrangements, the London bus has identical arrangements though slightly different designs in the seats, the stop bell and the announcement boards. The streets begin to look similar too. 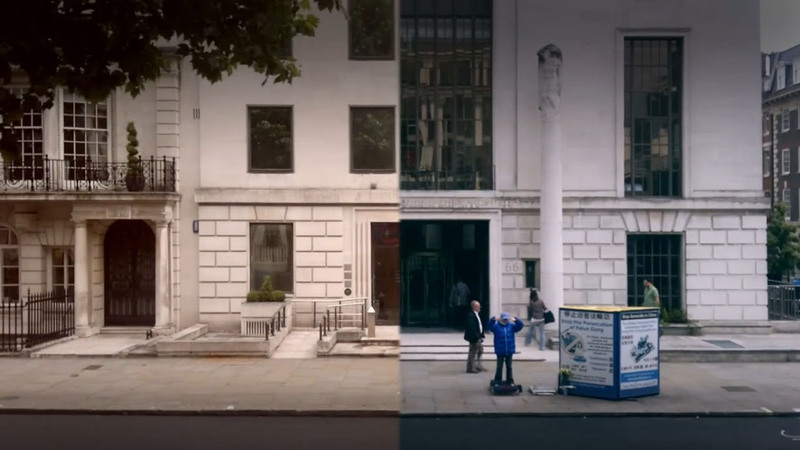 Although on close observation, they are in fact two different buildings, the use of streets with a similar horizontal element such as window lines, rustication extent and stone patterns blur the distinction between his view and her’s. Little touches like the bicycle messenger disappearing from one screen and emerging on the next as a gentleman in a suit riding a road bicycle give the film itself a sort of charm in its attention to detail. Finally we come to the last scene of the film which is a shot of the Hungerford Bridge approached from the two opposite banks of the river. While on the one hand, the distinctive structure of Charing Cross peeks behind the mast of the bridge, the other shows Royal Festival Hall sitting rather politely on the banks of Thames. 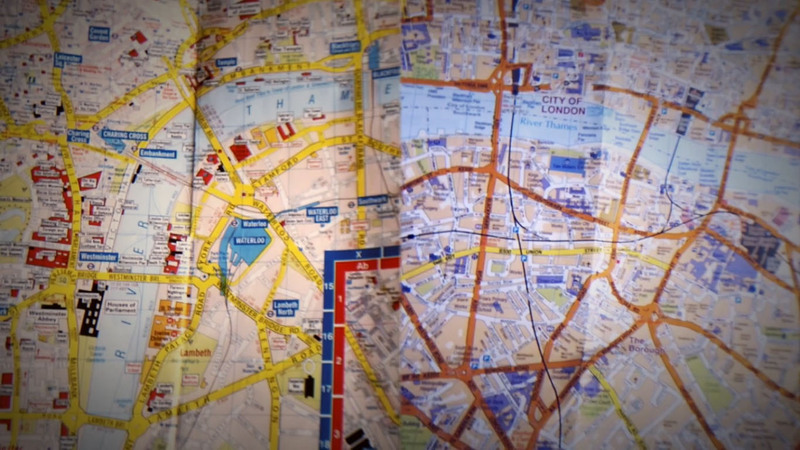 The final shot centers on two different maps of London which seems to represent the final distinction between the two halves of the screen before looking up to reveal the two characters, their faces not revealed until this final scene and even then, appearing only in the opposing character’s viewpoint. 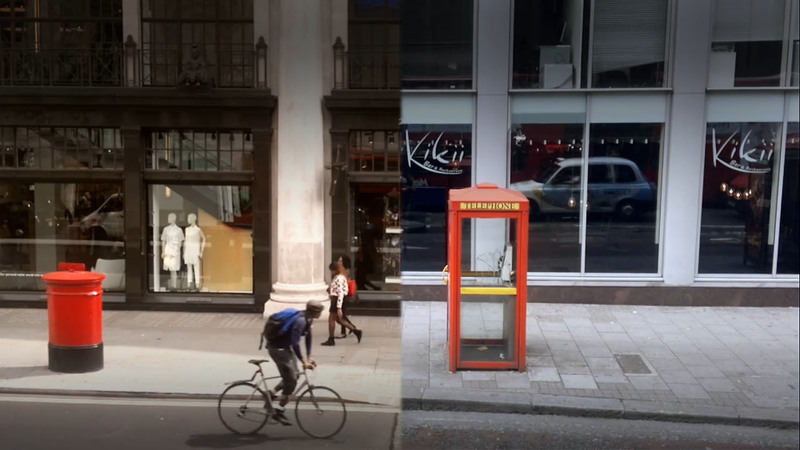 The sense of parallel occurrence within the two cities works for the film as it depicts the journey from the apartment to the meeting point in London. In hiding the actual character from the film until the very end, the short relies on the city to form the personality of the person in which it is portraying. In a sense, it is a demonstration of the personification of cities. Interestingly, Paris, an undoubtedly femininesque city with its Art Nouveau architecture, the imagery of the city at night and its artistic qualities represents the female character while New York, with its brick buildings, overall grayness in architecture and its notion as a financial centre, represents the masculinity of the male character. Little details which occur in the film could be seen as a sort of character building in the absence of dialogue, fashion of character and interaction with other people. 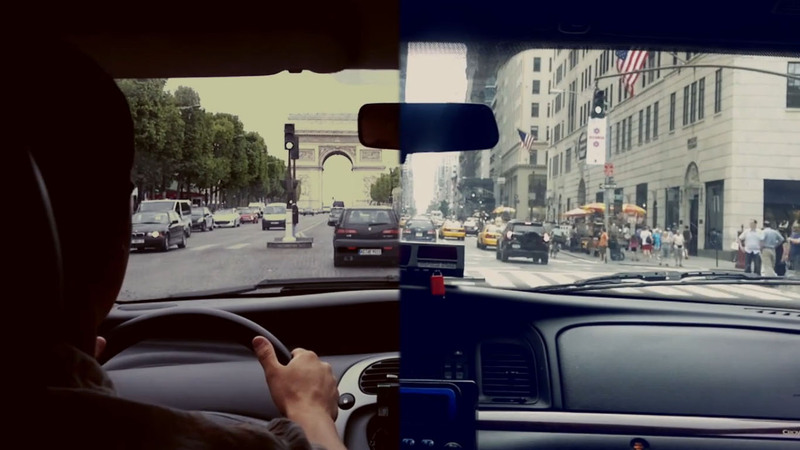 For example, the shot of the Arc de Triomphe and the taxi ride through the city of Paris suggest a sensitivity of the female character, while the populated sidewalks and yellow taxis of New York convey a sense of urgency and business manner of the city which in turn is implied through to the character. 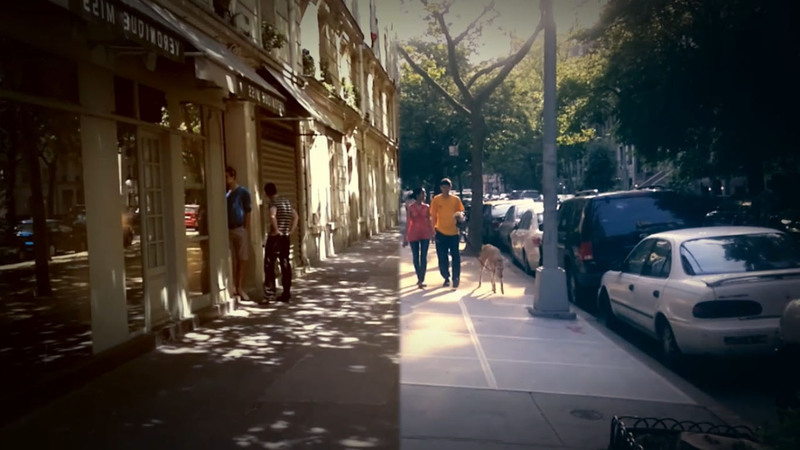 What Splitscreen does is strip the personality of the characters into merely their surroundings. This curtaining of the character turns the surrounding into the only glimpses the audience has of the character. 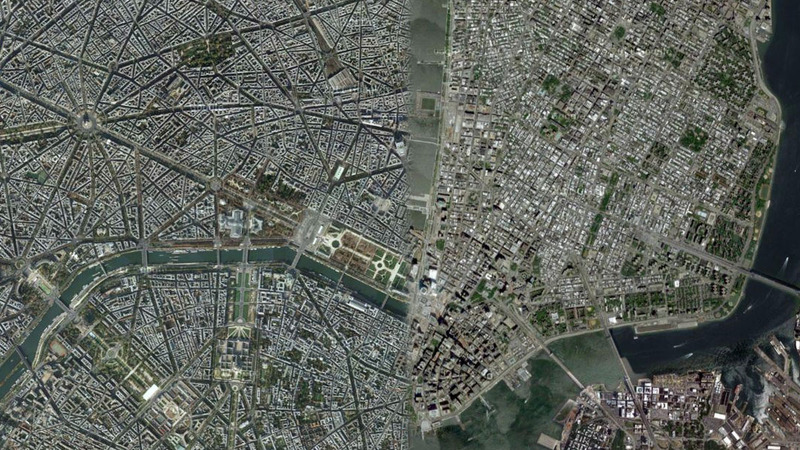 Cities inevitably take on characters defined heavily by their urban landscape and form. 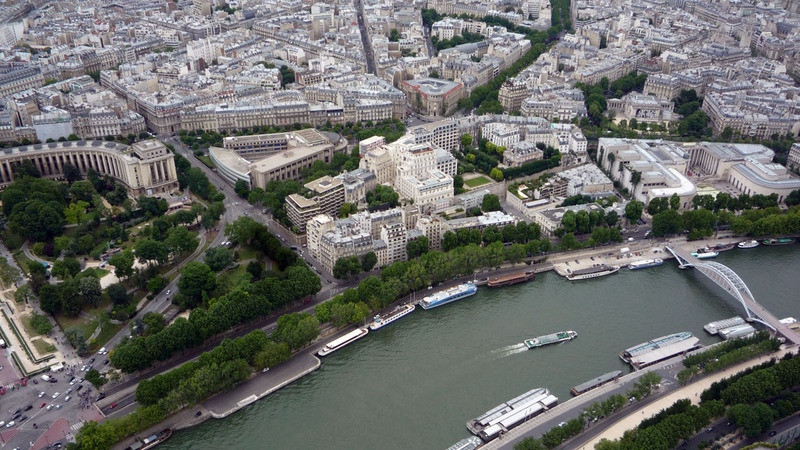 Like Paris and New York, many can be classified without doubt as masculine or feminine depending on their architecture, public furniture and overall portrayal in media. 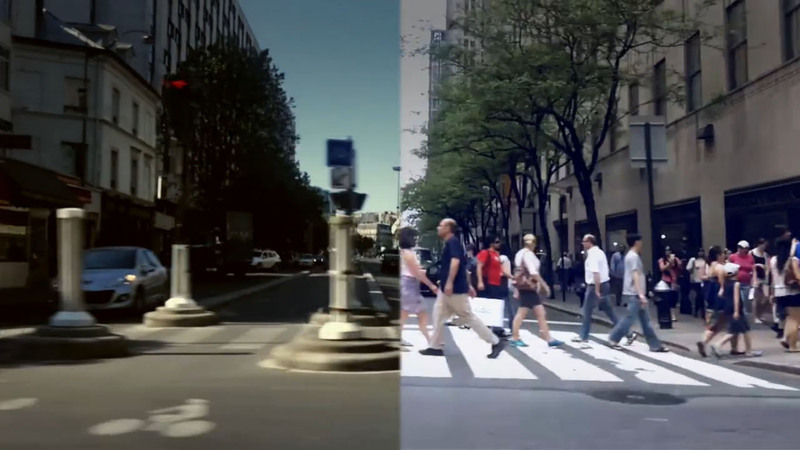 The film serves as a reminder of the way in which cities come to define the way in which we live. 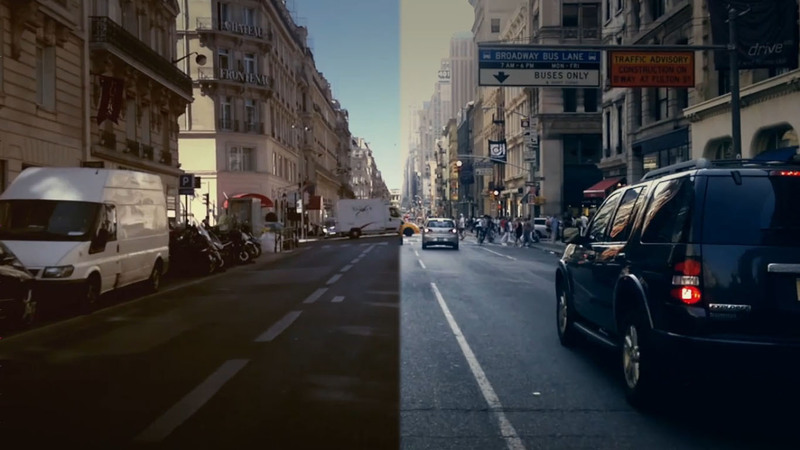 The personality conveyed of the city through the portrayal on screen is passed on to the characters in Splitscreen. In a similar way, we instantly imagine someone coming from Tokyo, London or San Francisco to have a certain personality. This may be viewed as a distasteful sense of generalization, but cities inevitably influence the lifestyle of an individual and the qualities of that city undeniably rubs off towards a person’s character. In essence, cities not as architecture or urban form alone define the way in which we live, but do so as in places. From the smallest detail such as the materiality of the urban fabric, to the way in which its citizens dress and even to the height and design style of buildings, all these interact to give a city character and personality. Collectively, the city attains a sense of personification just as the things a person wear defines who they are. Unlike a person though, the city cannot casually change from a piece of clothing and every article of clothing which it wears, it becomes part of its outlook and contributes to its character, like permanent markings on a layered painting. For those interested, the original pitch of the film could be seen here. It offers a look into the thinking and concept behind the film which is finely executed through the final result. There’s also a Making Of that looks at the way in which the film was shot and made to create the stunningly synchronised details available here. All images in this article are from the film Splitscreen directed by James W Griffiths unless otherwise stated. BOURKE-WHITE, Margaret. 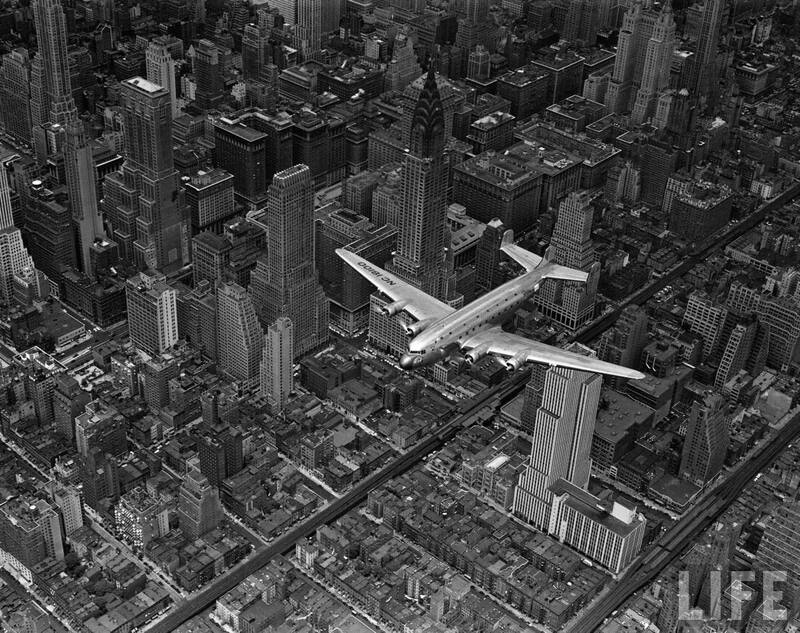 Airplane Over Manhattan. http://www.life.com/gallery/67131/image/50693628/the-75-best-life-photos#index/69. 1939.